This is Open Source Home Automation Project based on Arduino Uno and Arduino Wiznet based Ethernet shield. This is single relay controller board. You can extend this to as many as you want. I have made 5 channel relay controller board as below. All the usual warnings apply: Mains voltage (120VAC or 220VAC) can kill you. This project, if done incorrectly, could certainly burn down your house. Do not work on or solder to any part of a project while it is plugged into the wall socket - just unplug it before modifying anything! 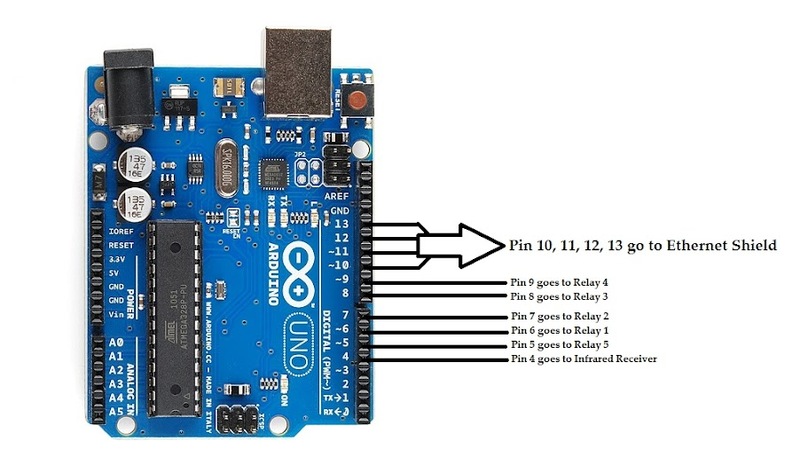 Now connect your Uno Board to PC with USB cable and open Arduino IDE. After Opening up you will find blank Arduino window. Now go to File--> Example --> Ethernet --> dhcp address printer sketch. Your Ethernet shields MAC address is printed on back of it as follow you will need this in DHCP ADDRESS PRINTER code to get the IP address of your Ethernet shield. In this way you can do necessary soldering work to make following connection. Once you finish soldering stuff, now you are ready for your main code upload. 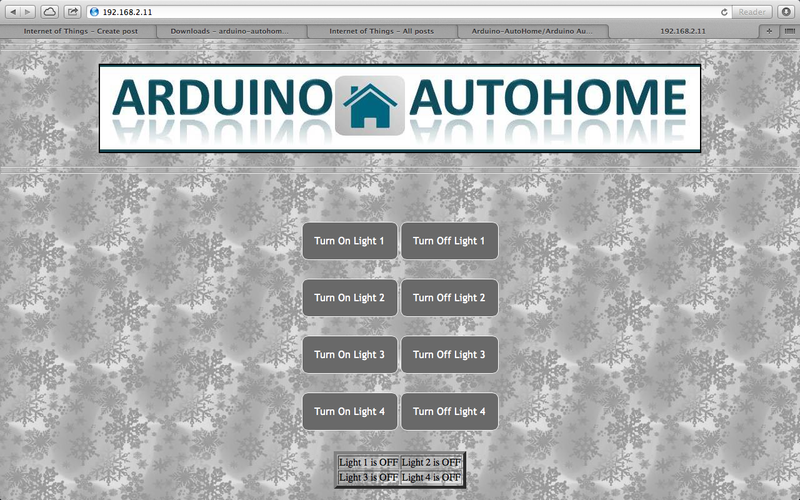 Here is the Arduino AutoHome code just copy and paste it into your Arduino IDE sketch. Upload this code to your UNO board. Now you are ready to your your Automation Project, just plug your Ethernet shield to router and and you will be able to find the control page on the IP Address specified by in in the Arduino Code. 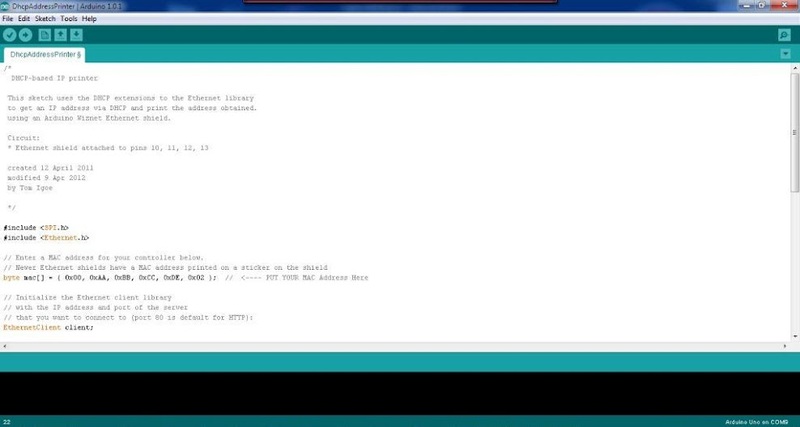 So directly enter the IP address in the web browser of the the device which is on the same network as that of your Arduino. As you understand the code you can modify to your need. So enjoy controlling things wirelessly..
GREAT PROJECT ! ! ! ! ! ! ! Is there an easy way to password protect the web server? hey. i am very interested with your project and i am thinking of making this project as my final year project. may i get the full report of the project? please contact me at my email, maziyatulkarimah@gmail.com. thank you. have a nice day. Everything about the project that you would need to do it yourself is mentioned in the blogpost. What else do you want? I want to make something similar, but adding some pir sensors for home alarm system. I already ordered an arduino Leonardo and arduino Ethernet shield. Lucky for me, I hade from an old project an TC35 gsm module, and I want to use it for sms remote. let's say i'm running the web control for switches at home, and there is someone at home who wants to switch manually at the same time while the web control is running. So do you have a solution for that ? You should probably check out the MySenors project to make your sensor wireless using the nRF24L0 radio. is ethernet shield cable rj45 is connected to laptop or some other place?? ip adress should mentioned in the code should be used in the web browser when accessing through wifi enablede devices. How to obtain IP address if it is connected to laptop? How can I get IP address for me. Hello, can anyone help me? i want to build bell door wireless for deaf people using two ethernet shield. 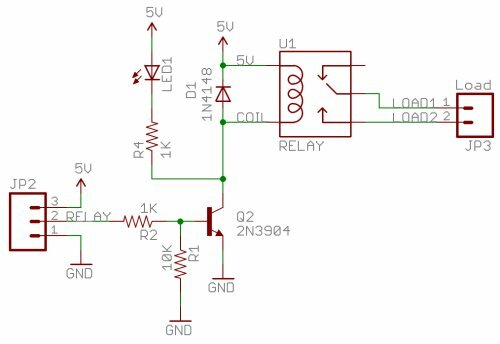 The idea is, if someone press the bell on the door, it will transmit the output to arduino 1 that connect to ethernet shield 1 and display it with LED and also transmit the output using wireless router to arduino 2 mounted with ethernet shield 2 and display it with LED on the other room. I don't plan using web server based. And all the example from the web is using internet connection and accessing/controlling via web, so i'm troubled over here. Help me please, i really appreciate it! does this work with the latest ide? Thanks for sharing. I like the graphics displayed on the page. Great work, but I have a problem. I connected everything ( I bought relay module on ebay), but it wont work. When I click "turn light on" nothing changes. Serial monitor gives "GET", but even in the table at the bottom of the page nothing changes. Any ideas? I really like your project!! I would like to know if I can connect all the components on a breadboard instead??? Wow diraj, what a talent, I am speechless. You have done such a amazing work about home automation products that I cant even thing about that, thanks for sharing. Hi.. Great work! It worked for me. I would like to know how to control the devices using other routers/ gateway. For example I would like to control from my office.. Your description is really very nice and interesting in which there is the discussion about Internet things. Thanks for sharing this info and please keep sharing. How to access the IP address if I am not at home! The devices can be switched ON/OFF using a SMART PHONE through Wi-Fi. Very nice, well written documentation and code. I really like how well it works, you have awoken so many ideas. Hey, nice work. I envy your programming skills! It seems logical that your next step would be to build a nice android app to connect it all. I had this same idea, but the programming is intimidating. SO I'll share the rest of my idea with you, maybe it'll spark ideas of your own. So, relays are just high power switches- you can control virtually anything with them that turns on or off with power. If you've got some wiring knowledge, the possibilities.... electronic door strikes (control your door locks from anywhere, remotely! ), power buttons on computers, networking equipment (if you cant be there to physically reboot them), garage door, lights, or anything you can run 5vDC to. And do it all without paying some middle company to keep track of your IP address. sir i have same problem .you got the answer?? how can i cantact you . Hey I need some help in this project. How can I contact you? hey i need some help in this project . how can i contact you? please where is the Infrared Receiver??? "Failed to Configure ethernet using dhcp". I'm stuck here, what should I do next? From what too did you draw all these circuit diagrams or what is the tool you usually use to draw logic gates diagrams? Is it creately ? would it be possible to make it password protect? can you help me !!!!!! Hey i think this project will work if i enter my external ip address and port number (normally 80) and forward the port in my modem + router`s setting to the arduino....and so i`ll be able to switch my home lights on or off...from the internet..
i'm trying this Project as BE Project. Great article, I've read it completely and got answers of many things which i didn't knew before keep on posting good things. Please keep updating us. Home automation systems are designed to be compatible with every kind of home and lifestyle,helping to make our daily lives easier and more comfortable. CSS file side is down!!! Hai the side is down the program is not showing the css file anymore Everything works but the buttons and page layout are gone. Such a nice blog post. That is very nice project with cording that is easy to understand. I like it very much and more useful for my knowledge.Thank you for sharing this post. Thanks for sharing such beneficial article with us. Thanks for sharing your project with us. This is very useful and informative for users. Please keep sharing with us. project is corrupt Shame on you for not answer help queation. Being just a shade beyond beginner I can say this is a great example of how to automate things using a ethernet shield and arduino. I did make one small change that may help other out when they try expanding upon the script. Visit our website if you are looking for home based work. @ 4th pin what is the use of ir sensor ??????? how to check internet connectivity ? When I upload code then show me this message "Low memory available, stability problems may occur." What should I do now???!!!! Use a Mega. The program uses a lot of memory. download css into Dropbox publick, create a publick linh and put that one in the place off the one that is in the arduino.ino file. take a nice background put that one also in a dropbox public. create link and copy that into the css file aswell. running on uno with eternet mega and Nodemcu . For who is interested. I did some work on this program and made it looks a lot better. I have made a CSS file and put it on my Dropbox. Now i can remotely change the background as i like ☺. the buttons made in a different color and ad a visibility to see if they are on or off. also added a Rf transmitter to is so i can remotely turn my lights off and on from the internet. the transmitter code is simple the tricky part is finding a remote socked 433 MHZ and read the code, but there are multiple side's that have ex samples. Also a DS3231 is added. Arduino: 1.6.11 (Windows 7), Board: "Arduino/Genuino Uno"
Sketch uses 12,494 bytes (38%) of program storage space. Maximum is 32,256 bytes. Global variables use 682 bytes (33%) of dynamic memory, leaving 1,366 bytes for local variables. Maximum is 2,048 bytes. Can u send me the details of this project on my email. I like to make it as my Final Year Project. how to make this project can be accessed in different network? Did you read the code? change port 80 to a port you would like. port forward it in your router. than you can login to this webserver from the internet all over the world! is an exsample you can find your external ip adres in your router. thank you sir, when i change the ip to my public then i can login over the world. is there any way to turn on the led when the connection down? when we outside the house. and if you want to turn on a led without a internet connection sorry that is impossible. Can you please help me with the sketch for 8 relays and and password protection for the app. I can't access it from others network. what should I do now??? Check if your router has portforwarding, Then put the IP and port from your Aurduino in the port forwardingsection and check if that port is not been used by a other item in your router. Nice blog post on Open Source Home Automation Project using Arduino UNO + Ethernet Shield. I can imagine having every operation in the house automated. On the positive side, there will be more time the family members to bond and spend time together and those studying can have more time to focus on their studies and access online writing services for help when Redoing Dissertation. This is nice information on this blog regarding home appliances online, Thank you so much for this. Will it work if i made a ajax get request with relay1on parameter ..? I've designed a PCB for the Relais. Bike on rent in Jaipur. it is all in the top off this article !! Hey, that’s really a good post on Electronics Appliances Classifieds Help Adya, i really like your blog as the information is very useful if you are a pet lover. Well, there is one more site for the same service www.helpadya.com you should check it for more detail. can give me ur email?i have some question want ask u..
Hey your blog is very nice, such useful information you are sharing. I really like your blog the information is very accurate and if you want to know more about List of Television Dealer in Delhi service, there is another website with best information. Being One of prestigious office on rent in pune , ABCWorld offers spacious and ergonomically designed executive executive office space and office space in pune . You have shared really an amazing and nice post about the iot,. Apeejay Business Center Workspaces is a premium collaborative coworking space Pune. We have discover a coworking space where you can grow your professional networks. this project over internet? or only lan? Apeejay Business Centre in Pune is Providing fully-furnished and equipped workspace in Pune & commercial office space in pune . Join our DIAC for Knowledge Related to Industrial Automation Control & Field Instrumentation . (PLC / SCADA / HMI / VFD /DCS /PANEL DESIGN /CONTROL PANEL WIRING / FIELD INSTRUMENTS, AUTO CADD ,FINAL YEAR PROJECTS) Stay updated on the latest technological trends. Also contact us for academic projects/IPT/Workshops/Seminars for BE/ BTech /Diploma for all Department Students like ECE, EEE, MEC, EIE, ICE etc., & working professional . Join for bright career options ! Contact Number +91 9310096831. Excellent information with unique content and it is very useful to know about the information based on blogs . sir , i am not able to control the realy board with the help of buttons on the HTML page , can you tell me what is the main problem. Netguru Solution India Pvt. Ltd. is one of the leading and developing Website Design and Mobile Application Development Company in Pune. We make website design and development simple by providing answers to address your issues. With our group’s joined involvement in visual communication, site advancement, search engine optimization and activity, you can be sure that whatever your venture requests, our web engineers can convey on time. We offer Website Design, Web Development, Mobile Application Development, Android App Development, iOS App Development, SEO, Internet Marketing, Web Maintenance and Hosting, Web Branding and Vector Art Solutions. thanks for shearing such an informative blog with us. it is really helpful information that how someone can save his site. Thanks for sharing this kind of useful information TOCCOLIFESTYLE offers best techniques and how it works. Internet of Things groups is a local group at Pune, India. It was started by folks who also now run Doo - a Maker Space. 1. To foster a DIY culture for electronics and hacking with sensors for fun and knowledge. 2. Engage with educational institutes to introduce arduino kits for fun and learning. Twitter Sentimental Bulbs + Ruby! Using Raspberry Pi as a torrent client.